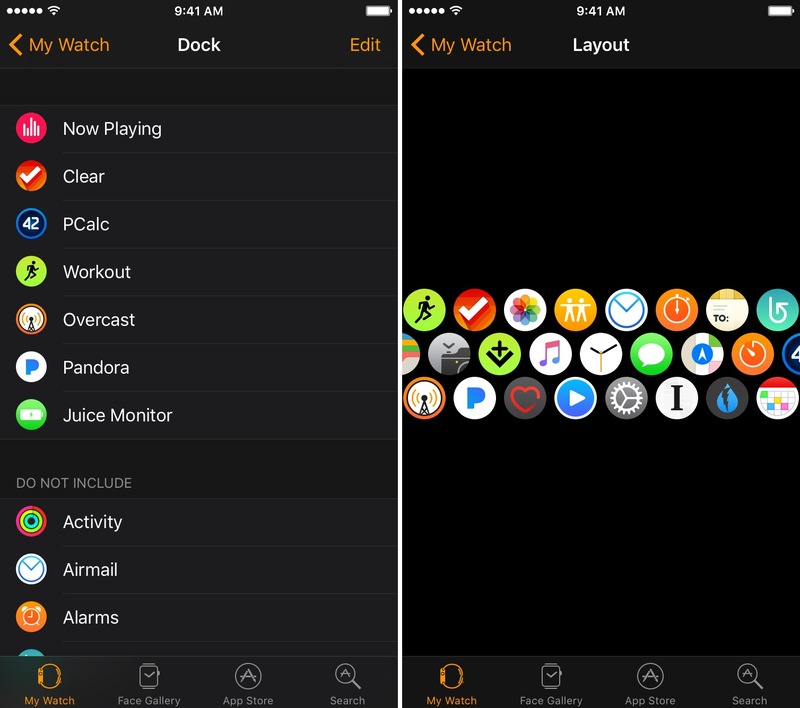 Earlier this month I saw a tweet from Mayur Dhaka, in which he mentions that he’d love to read about how Apple Watch owners manage their setup. I then noticed that Matt Birchler, the biggest Watch enthusiast I know, had shared his and I knew I had to do the same — if only because of my wacky app layout. I saved Mayur’s tweet and Matt’s piece to Instapaper as a reminder to write about the topic. As these things tend to go, it took a couple weeks for them to resurface. But, the following is my Apple Watch setup. I have two Watch Faces that I use for different contexts. I have Modular, which I use while I’m at work, and Utility for everything else. I like Modular at work because it’s so data dense and glanceable. It gives me all the information that I need in large, clear type. Utility is great for my time outside of work because of my differing priorities. I care much more about how attractive my Watch face is than the clarity of its complications. I’d rather have the time, displayed in a beautiful form, take up the bulk of my Watch’s screen than clutter the interface with a bunch of information. I still like having complications, but I don’t need them to be front-and-center, like they are with Modular. The first three complications appear on both Faces. I consider these to be essential pieces of information that I want regardless of what context I’m in. Timer and Fantastical only appear on my Modular face. Fantastical is useful because I have reoccurring, work-related events on my calendar that I need to stay on top of and I frequently use the Timer to keep track of my breaks. 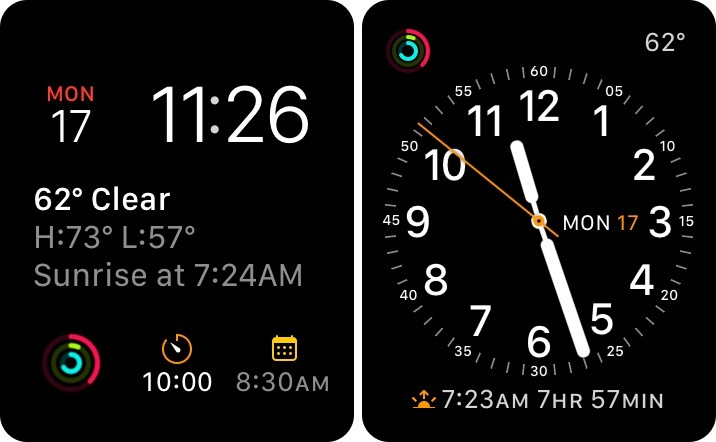 The Sunrise/Sunset complication only appears on my Utility face and is invaluable for coordinating outdoor activities. I’ve quickly taken to the Dock on watchOS 3. It’s a far better experience for opening apps than swimming through the sea of icons in the app launcher. Most of the apps I use regularly on my Watch already appear in complications, but there are certainly some that are a far better experience when they take over the whole screen. These are my most-used, non-complication-worthy, apps. I could probably add a few more to the list, but I prefer to keep my Dock as small as possible. I’d rather not swipe through a dozen apps to get to the one I’m looking for. For me, seven apps in my Dock felt like a good balance between utility and usability. As for my app layout, mine is a bit unconventional. I keep all of my apps in three rows, that extend to the left and right, with the Clock app in the center. This is the only way I’ve found that allows me to keep some semblance of organization inside of the terrible honeycomb icon interface. I can swipe to whatever app I need without ever feeling lost. I keep unused apps on the outskirts, followed by my complication and dock apps, with the everything else sitting near the center.